Last week we went over what 6 basic things you need to include in your story. Now, step two. The second key to telling your story is to tell it in a way that makes people listen and remember it. Every good story has conflict. Bob waking up and going to work as an Insurance Agent happily forever after is not a good story. And it’s not realistic. You may not think your company story has conflict, but look deeper. Did you struggle to start your own agency? Did you start it and then experience a down turn that made you wrestle through whether to keep going? Did you decide to become an insurance agent because another job path ended? Sometimes when we tell our business/company stories, we hesitate to show any downfall, any struggle, any mistake or hiccup. We want to come across as polished and perfect to our customer, but that’s a big mistake. Perfection is not relatable, and we rarely trust what we can’t relate to. Struggle is universal, and it’s something that every listener can understand and empathize with. Which leads us to…. 2. Engage your listeners’ emotions. “None of the facts and figures matter until you have some sort of emotional connection,” said Bates. “Stories are a great way to connect emotionally.” When crafting a story, Bates recommends thinking about what emotion you want to communicate and then provide information to support the emotion. Similar to the struggle and conflict in your story, show some emotion. What’s your emotional connection to Insurance? Have you ever had a customer that had the unthinkable happen, but their policy with you helped get them back to whole? Was your mother, or your uncle, or someone you cared about in Insurance and that drew you to it? What’s your emotional tie in your story. Tell them, and let them feel it too. Nobody wants to do business with someone without emotions. 3. Give Your Audience the Pieces that Matter. My best friend in High School was notorious for being interrupted in the middle of her stories. Why? She took too long to tell it. She’d laugh to herself as she turned off on her tenth rabbit trail along the way, and quickly, someone would talk over her again. When telling your story, get a feel for the audience. You might even practice a couple different versions of your company story to have ready for different audiences. There’s the 30 second version you tell when you’re meeting someone in passing and they prompt you. There’s the 2 minute version you tell at parties and in your office. And then there’s the 5-15+ minute version you can tell to whoever seems to have the time and interest. But even for these longer listeners, keep it as brief as necessary. Don’t tell rabbit trail stories off the main one. Keep your focus. 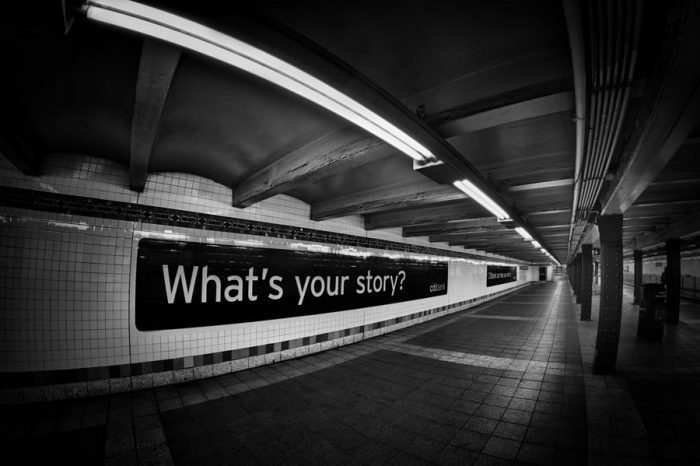 Tell your compelling story. And then be done. Now use these tips and incorporate them in your conversations this week. Whenever you’re trying to sell someone on your business, you should be telling your company story — stories are what compel us to buy in to anything. So start practicing this week and share with us how it goes (Share with us on our Facebook page HERE).